Bratwurst is a versatile dish, and several different cooking methods are available. Bratwurst has been around for centuries, with the first recorded mention of them coming during the 14th century in documents found in Nuremberg, Germany, according to the Bavarian Department for Food, Agriculture and Forestry. Although there are many variations of bratwurst, the type commonly made in the United States has ground pork shoulder, pork fat and various seasonings in a hog casing, which is the intestine of a pig. The versatility of bratwurst lends itself to several cooking methods. Two of the most common are grilling and boiling. Create a low- to medium-heat fire if using a charcoal grill; set a gas grill to medium heat. To determine a medium-heat fire on a charcoal grill, hold your hand about an inch above the grates. If you can hold it between four and six seconds, you have low to medium heat; any less time and the fire needs to cool down some before putting the brats on the grill. Create indirect heating areas on the grill. If using gas, turn half of the burners off; if using charcoal, only place briquettes under half of the grilling area. Place the bratwursts on the grill. Spray any flame flare-ups down using the water bottle. Turn the bratwursts every five minutes. If the flames get too high, move the sausages to the indirect heating areas until the flames lessen. Grill the bratwursts for up to 25 minutes, or until the sausages read 165 degrees Fahrenheit on an instant-read thermometer. 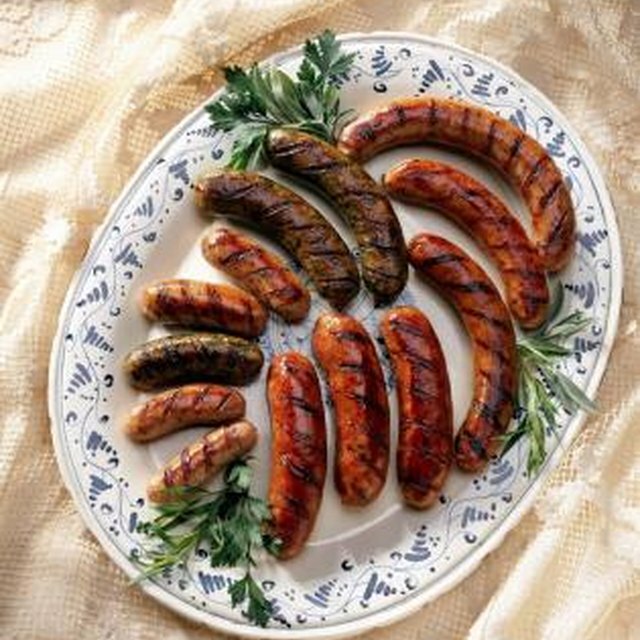 Remove the bratwursts from the grill and let them rest for five minutes before serving to allow for carryover cooking. Fill a large skillet with beer until an inch of liquid covers the bottom of the skillet. Bring the beer to a boil on medium-high heat. Add the bratwursts to the skillet and begin to boil them. For added flavor, peel two onions and cut into thin slices. Add the onions to the skillet. Turn the bratwursts every five minutes or so using tongs. Add more beer or water as needed for the first 10 minutes. Keep turning the bratwursts, but start allowing the beer to cook away. After 20 to 25 minutes, the beer will cook away. Check the internal temperature of the bratwursts, which should read 165 F on an instant-read thermometer. Saute the bratwursts and onions for a couple of minutes to caramelize both. Turn off the stove and remove the bratwursts and onions. Allow the bratwursts to rest for five minutes to allow the juices to redistribute within the sausages.